According to the report, America now has over 242,000 solar workers, with nearly 4,000 of those right here in Virginia. Solar jobs in Virginia increased 9% between 2017 and 2018, putting Virginia in 20th place for solar jobs by state. a nonprofit, nonpartisan organization dedicated to advancing the use of solar and solar-compatible technologies worldwide. We believe that increasing access to this clean, abundant, reliable, and affordable energy source will lift up people’s lives and bring about a prosperous future for all. Earth Day 2015 is just around the corner, and this year Resilient Virginia would like to share with our readers an inspirational vision of the future. This comes through our exclusive sneak peak of the ebook on The Celestia Project, which will be unveiled officially by Green Builder magazine on this Earth Day. Over the past year, chapters of The Celestia Project were featured in issues of the magazine. 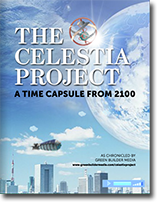 The Celestia Project, created by Matthew Power, Editor-In-Chief of Green Builder magazine, presents a time capsule from the year 2100. The interactive publication takes on such topics as food security, low impact transportation, successful urban living, energy use and decarbonization, fresh water abundance, and resilience in buildings and communities. You can view the entire interactive ebook here. This magazine is oriented toward residential building professionals, but also has excellent annual “Homeowner’s Handbook” and “Sustainable Landscaping Guide” issues which make it interesting reading for anyone interested in low impact living. Go to www.greenbuildermedia.com/magazine-home-page for more information. The nonpartisan Georgetown Climate Center seeks to advance effective climate, energy, and transportation policies in the United States—policies that reduce greenhouse gas emissions and help communities adapt to climate change. Led by Executive Director Vicki Arroyo and Faculty Director Professor Peter Byrne of Georgetown Law, the Center also seeks to ensure that national climate and energy policy is informed by lessons from existing state efforts and that national policies maintain an ongoing role for state innovation and implementation. Serving as a resource to all states in addressing climate change and promoting a clean energy economy. Based at Georgetown Law, the Center works extensively with government officials, academics, and an array of stakeholders to strengthen state and federal climate partnerships. The Center analyzes the provisions of federal policy relevant to states and territories, and encourages policymakers to learn from and adopt innovative policies emerging from the states. Visit the Georgetown Climate Center website for tools, reports, and more. Climate change and sea-level rise pose unprecedented threats to communities across the world, especially the heavily-populated urban coasts. There is increasing evidence that the changes anticipated for the 21st Century will push the climate outside the range known to civilization and into a phase of much greater variability. This will challenge decision-making in all societal sectors, and it will require a new level of preparedness to mitigate the impacts and adapt to the changes. The Mitigation and Adaptation Research Institute (MARI) at Old Dominion University engages in research that produces the practice-relevant knowledge needed to address the challenge of climate change and sea level rise for the coastal zone. In doing so, MARI responds to the knowledge needs of a wide range of community stakeholders, including government, military, private sector, and private citizens. The investment that Old Dominion University has already committed in the form of the interdisciplinary CCSLR Initiative has paid dividends, with many local and non-local stakeholders already actively engaged and faculty from across ODU’s departments and colleges in an active, collaborative attempt to begin to seek solutions to the problems we face. MARI facilitates and engages in research, education and outreach to promote and enhance the understanding of climate change and sea level rise and their multi-faceted impacts on the built environment and the social fabric of coastal cities. MARI works with societal stakeholders to develop options to mitigate and adapt to these impacts and support these stakeholders in the application of the knowledge resulting from the research. Visit the MARI web workspace at www.odu.edu/mari. Rebuild by Design was conceived as a HUD competition to respond to Superstorm Sandy’s devastation in the United States’ northeast region. Initiated by the US Department of Housing and Urban Development and the Presidential Hurricane Sandy Rebuilding Task Force, Rebuild by Design connects the world’s most talented researchers and designers with the Sandy-affected area’s active businesses, policymakers and local groups to better understand how to redevelop their communities in environmentally and economically healthier ways and to be better prepared. Visit the Rebuild by Design website at www.rebuildbydesign.org. The Resilient Design Institute (RDI) creates solutions that enable buildings and communities to survive and thrive in the face of climate change, natural disasters and other disruptions. Visit the Resilient Design Institute at www.resilientdesign.org. Read the Resilient Design Institute blog at www.resilientdesign.org/category/news-blogs/. The U.S. Green Building Council (USGBC) believes we must continuously look over the horizon to foreseeable and unforeseeable crises and see what plans are on the table, what preparations need to be made and what assets are in place. And when these tragedies do occur, we need to deploy the resources and assistance to help communities recover smarter, greener and better. Visit their website at www.usgbc.org/advocacy/priorities/resiliency. The objective of the National Institute of Standards and Technology’s (NIST) Disaster Resilient Systems Program is to develop and deploy advances in measurement science to enhance the resilience of buildings and infrastructure to natural and manmade hazards. Visit NIST’s Disaster Resilient Systems Program website at www.nist.gov/el/building_materials/program_structures.cfm.